Pawn your Chopard Watch! We offer Loans on Chopard Watches! Chopard ladies’ and gents’ watches are among the most luxurious timepieces in the world. Lovingly hand-crafted in Switzerland by skilled artisan watchmakers, these luxury watches exude prestige, glamour and class. If you’re thinking “should I pawn my Chopard watch?”, the good news is that it’s relatively easy to secure loans on Chopard watches and jewellery. The Swiss watchmaker, Chopard, first began making pocket watches and ladies’ watches back in 1860. As such, older models are becoming rarer, which only serves to increase their desirability. Chopard watches are regularly purchased as investments and are often used as collateral. Nowadays, it’s possible to borrow funds with loans on Chopard watches as a means to access much-needed short-term funds, perhaps to go towards another investment or purchase. At New Bond Street Pawnbrokers, we operate an open door policy. This means all are welcome to drop in at any time for a watch valuation for loans on Chopard watches at our discreet shop in central London. However, it is recommended that you call ahead in order to book an exclusive, one-to-one appointment where we can offer you our complete attention while we accurately value your timepiece. If you have any more questions or would like directions to our Mayfair offices, please do not hesitate to get in touch. • We are FCA accredited. Why are Chopard watches so valuable? How old is your Chopard watch? Like all collectables, the age of your timepiece could increase its value due to exponential rarity. The very first Chopard pocket watches, such as the Luis Ulysses model, are over 150 years old. Anyone in possession of such a watch could expect to receive in the region of £1,500 to £6,000, depending on its condition. That’s not to say that modern Chopard watches don’t command a reasonable price tag either. In fact, pre-owned Chopard Classic Racing model watches routinely fetch around £1,300 at auction, while the Mille Miglia model (a limited run of just 250) can command up to £7,500. What condition is your watch in? The condition of your watch is arguably the most important factor when it comes to pawning or selling. A well-cared for watch will retain more value that one that has seen its share of knocks, bumps and scratches. Of course, functionality matters just as much as appearance. The better the overall condition, the higher the price tag and the better the loan you’ll receive. For pawnbrokers, lending against a Chopard watch becomes much easier if you can provide provenance. Your watch will be considered much more valuable if you can provide documentation such as proof of purchase, service histories and certificates of authenticity. 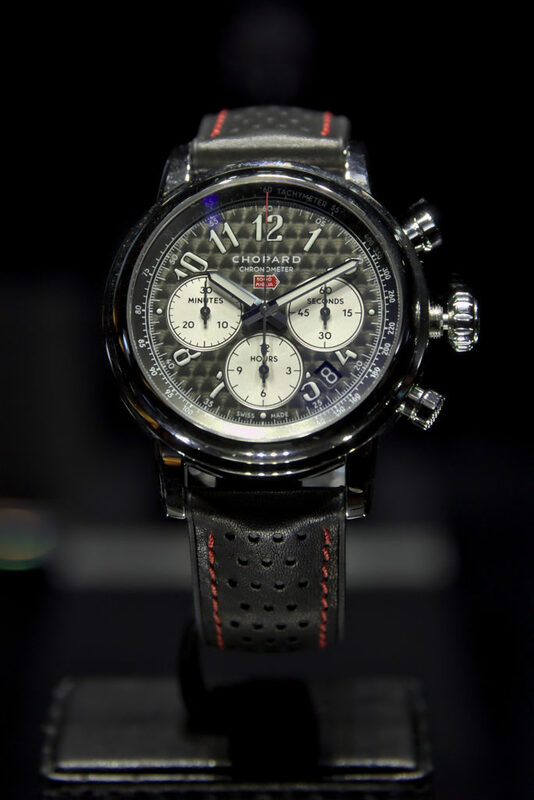 Over the past 150 years, Chopard has manufactured a variety of different models over the years – some of which have been designed for practicality (like the Classic Racing model), and others which are part of a limited run (like the Mille Miglia 161889 series). Rarer models like the L.U.C XPS 1860 Edition are much more desirable, on account of the materials used in their manufacturing and the market scarcity of the model. How much do Chopard watches sell for at auction? To learn more about our loans on fine watches you can visit our dedicated webpage. Finally, some of the many watch brands we loan against include: A. Lange & Sohne, Breguet, Breitling, Bulgari, Cartier, Chopard, Harry Winston, Hublot, IWC, Jaeger LeCoultre, Omega, Panerai, Piaget, Richard Mille, Roger Dubuis, Tiffany, Ulysse Nardin, Urwerk, Vacheron Constantin, Van Cleef & Arpels, Audemars Piguet, Patek Philippe, and Rolex to name just a few.